This interview is with Cara Buchlater. She was an artisan featured in Brew to Bikes: Portland’s Artisan Economy by Dr. Charles Heying, which inspired this latest research effort into the artisan economy. Cara was initially interviewed for her successful illustration business. As a jumping off point for post-“B2B” publishing and the unfortunate economic collapse, she was an excellent person for perspective on what is going on in the trenches. We revisit the past, talk about the present, how she’s shifted her business, and explore the future. In this interview I learn what something called a Ketubah is and get distracted by a really cute baby. You can listen to the full audio here with intro music by local artist Purse Candy – hopefully soon to be featured on this blog! Enjoy! TB: How are things different since the Brew to Bikes book was being written? CB: 2008 was around the time of the [economic] crash, so back then, I was more optimistic. The local art scene has changed. It exists to an extent, but it’s different. I’ve been out of the scene since I’ve had my baby, but my friends are still in it. There is a lot less going on. There used to be a lot of art shows, craft shows, street fairs, where people of a certain caliber could sell their items, now there are only 3 or 4 a year verses before the economic crash. Crafty Wonderland is still going but no more monthly fairs, and those used to be a staple for making some cash. It’s only happening twice a year now. There is also [an event] called ‘Bargain Hunting’, it’s big and happens right after Christmas and in August. It’s a great one; I did it the day before I gave birth! It caters to artisans, craftspeople, jewelers, everyone making things on a small scale, locally. There were also school auctions where people would spend money. Now these events don’t happen as much and when they do, people are doing a lot more looking rather than buying. For me now going to events is harder and it’s not necessarily worth the money. If I hire a sitter and pay the booth fee, that costs me and it’s a huge gamble as to whether things will sell. I can’t speak for everyone. Lower price point stuff still seems to be selling, but you have to sell a lot of it to make a living. TB: So have you shifted your business? CB: I have always done calligraphy and now I am really focusing on Jewish marriage contracts. My illustration business started as an off-shoot of that but now it’s back to being my main focus. It’s a fully online business. There are a lot of heavy deadlines but I am making this work. I am doing really well with this. TB: Tell me about Jewish marriage contracts? CB: It’s called a Ketuba. It has an aspect of vows, but was written primarily to protect the rights of the woman. It’s ancient language and way ahead of its time. They are in Hebrew and English. 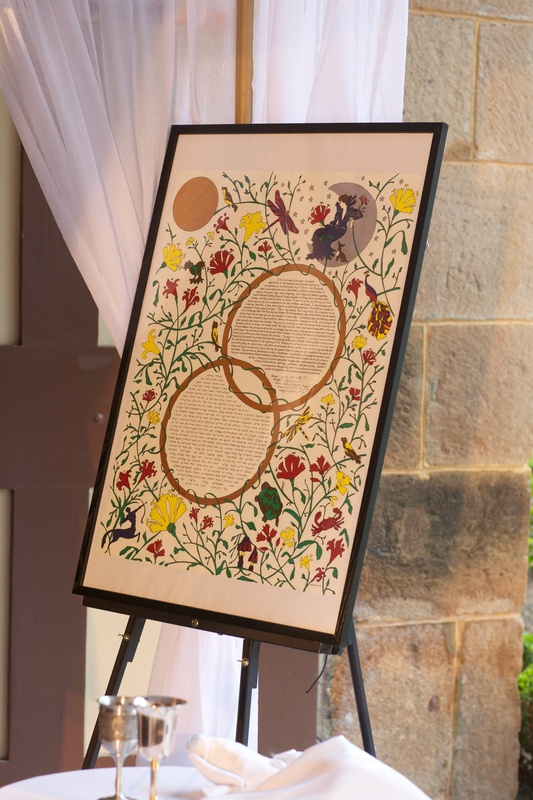 This is what a Ketubah looks like! It is completely hand-made. TB: Wow! That’s really cool and your work has been featured in People magazine, which is awesome? CB: It’s really helped up start my career this year. TB: It certainly is a niche market. CB: Yes, exactly and it’s what has saved me is this economy. Being a really niche business and having really good internet presence. Not many people do it and people still spend money on weddings even in a bad economy. The way I am working now though it’s highly artisan and it’s not the best business model. It’s complicated, each piece is handmade. I meet with the bride and groom. It’s a long process; it’s a lot of work. I can only do so much. I can’t work around the clock and I can only make so many. I realized this when I started getting a lot of business and I thinking, “I am not a machine”. I physically can only handle so much and meet deadlines (a wedding). So, I have been rethinking how to do this; I am considering making templates. I can create the full Ketuba template and leave the blanks for the information that changes and included the standard text. TB: So you work with every couple. Can you predict who will stay together by how it goes? TB: Getting back to your business model, what are your thoughts? CB: I’m having a problem with how I am going to distribute them. If I screen print them, they remain fully artisan. I have friends that have a screen printing business – I’d contract with them. It’s still completely handmade and screen printing lasts forever. I would be supporting another local business and creating a true work of art. To do that though, I will have to pay out a lot of money up front and would only have a limited number of prints and then I’d have to make more. I can’t personalize it all. My friend, the other Ketuba artist uses a color printer, then she can print them all herself and she has complete control over the process. People are attracted to what I do because I do everything by hand. The look is classical, it has small details. Even if you use archival printer paper you can’t guarantee the shelf life [when printing them from a computer]. The paper will probably fade in 100 years. This is a marriage contract and it’s also a piece of art. That said, from a business standpoint [the other Ketuba artist] is right. It’s less time, less headache and I could produce more. I could be more flexible but it’s against my artist integrity. TB: My husband is a chef, he’s self employed and does a lot of small scale caterings. He tries to use local, organic ingredients and works with clients to make each menu. Like you he has shifted his business so that now he does more corporate caterings, but he is still trying to individualize each event, still working with local growers, still doing menus for each. Sometimes he is so busy I think he needs to streamline some of his practices but like you he doesn’t want to risk his artistic integrity as a chef. He explains that if you start cutting corners you lose the thing about the work you are doing that makes it meaningful; it’s the thing that makes it worth doing to you. You won’t have that if you take short cuts. The idea of printing a marriage contract on a printer seems wrong. CB: But that is how everybody does it! They sell them in synagogues that way. They use fancy computer printers. People say “Who is going to know the difference”? TB: You are going to know. CB: I am going to know and I wouldn’t buy it. No matter how beautiful I thought it was, if it was printed on a computer. I would never do that. I also don’t have a cell phone though (laughs) so there are things about me that are weird. I am not a model. But I do think there are other people like me that would know the difference, especially if I explain it, and that is what I do. I tell them I make everything by hand, support local industry and the art scene here. I think people appreciate it and realize I have to charge more for it. TB: Portland has a lot of conscious consumers of quality, more so than other places perhaps. CB: I have never sold a Ketuba locally. TB: What? That kind of messes up my theory! Are you not connected to the Jewish community here? CB: The local handmade ideology speaks to people here, but it is hard in this economy. It’s like it speaks to me, but this is $200 less! TB: It’s only speaking so loudly. CB: (nods) so then how do [I] make [myself] competitive? Are you going to print a [ketuba] on a computer or are you catering to a niche market and if you are catering to them, they aren’t here. 90% of my business is on the east coast. My husband works in a synagogue here and I used to work there. I’ve always been part of the Jewish community. People in Portland aren’t going to be paying the money for weddings where you would have a piece of art work commissioned. People on the east coast will. TB: It’s an export. I guess in some ways that’s okay. But it makes me sad that you aren’t getting support for your work here. CB: In Portland people aren’t having those kinds of weddings. They might buy a nice Ketuba, but they aren’t going to get an artist commissioned one. I would like to be able to cater to a larger audience that’s why I’m thinking about what I am considering with the templates. I can create a large body of work and people can choose what they want from my website. I can fill in the information and be done. I believe it would allow me to develop my business locally because it’s more affordable, less fancy and something that captures the consciousness of Portlanders. I would love to be able to provide this service for people who don’t need to spend east coast money on a wedding but would still want something nice from a local business, something original and still handmade. TB: So then templates on a website, instead of sitting down with the couple. CB: If they want to pay me a really good amount I will! It takes 2 months to make one and I can only make 6-10 year. I can’t make a living on that. I can’t sustain myself. As it is now, I get a job, I have to take it. This summer I was working on 3 at once. I wasn’t sleeping because of the baby and I was working all night. I don’t need that. TB: I wanted to explore work life balance with you. You are making some money. Do you feel comfortable with the way things are going? CB: No, because I am not able to get to the next level. I have done some really high profile stuff, my name is being circulated around the celebrity wedding circuit and that’s great. I am really poised to take it to the next step, but I have to figure out how to do it where I can make a real living and support my family. I feel like I can make this happen with the templates. I would have time to work on marketing and promote myself. Right now just work on projects. Time is so precious, managing the baby and doing all the work [I am offered] because I have to take what I can get. Cara’s Ketubahs are commissioned pieces of art. This is very high end. No kidding- this one was featured in People Magazine. Hillary Clinton was at the wedding. TB: So you are looking for the sweet spot, the moment in between where you are maintaining your artistic integrity and making a living. What do you think the best could be? CB: Having a business where people order off the web and I am still creating new products so they would be limited editions, limited series, not mass marketed. I would also still do commissions. I just can’t rely on them. Winter wedding season was great, summer strangely not. I think having a more marketable product would allow for more commissions as well. People will say, I really like your style but I actually want something unique. I can do both. Also, I am still doing illustration work. They are being licensed and that where the money is, not selling screen prints at Crafty Wonderland for $20. The San Francisco Opera is using one of my illustrations, so is another theater in LA. There are two wine labels out there that are my work. I’ve been working with a local winery, La Ve de Moen on Stark and 12th – it’s new. She found me online because she wanted an art deco illustration and then realized I lived in Portland. She said she probably would have used me anyway but the fact I was in Portland made the deal. So now each time a new varietal comes out they use a new illustration for the label. They wanted someone with a unique style. Every six months I do a new label for them and I get to work with them face to face and they get to see the originals instead of the digitals. There is a lot of potential with local business here. There is a big artisan economy here and people want to support each other. TB: Connections between artisans and local business are being made? How people are finding each other? CB: The internet. People do searches and they find each other. The internet search is the way. It’s what people go to first. You won’t just go on recommendations of other people. You want to look at it yourself. People will look for local people online too. But I find that even when I’m not looking for local I find a lot of Portland based people. There is a lot going on here but I think I am also attracted to the aesthetic. TB: Right, let’s talk about that. I am interest in the Portland aesthetic too – what do you think that is exactly? Describe it for me? CB: It’s the joke from Portlandia about “put a bird on it”. Very prominent, very Portland. Organic ideas, looking like something is handmade, that someone put the time into making it, classical qualities. TB: Give me some examples. TB: That’s so funny, I was just there [Broadway location] the other day and I was thinking about how it really is such a Portland thing. I think it’s inspired so much of what is here. CB: Absolutely, it’s kind of Victorian and yet it feels modern somehow. It’s hip but it’s very Victorian. Some people would call it “old lady” but it’s not. TB: I think there is a whimsy about it. CB: That’s part of it, but also its hand done, not digital. TB: Do they have someone who does their stuff? CB: They have group of artists that they work with. TB: Their spaces are so different than the warehouse like spaces that so many other restaurants occupy. I love the idea that they reuse buildings in such creative ways. CB: It’s a very Portland thing too. There could be demolished building or you can make Edgefield and what else would that be used for? It’s antiquated but instead of tearing it down, make it a bar and music venue! Brew, food, fashion, bikes – what do these have in common? They are all part of Portland’s emerging artisan economy. Other cities have their bohemian districts, but Portland stands alone as an urban economy that has broadly embraced the artisan approach to living and working. The Artisan Economy Initiative is an extension of research that was first published in Brew to Bikes: Portland’s Artisan Economy. Rich in detail and also theory, Brew to Bikes describes how the transformation from a mass production to a post-modern economy is being articulated in the trend-setting edges of Portland’s artisan production. The thesis of the book is laid out in a simple table that compares the relevant characteristics of mass production and artisan economies (Characteristics Table) and is examined in chapters that profile hundreds of local businesses. The success of Portland’s artisan economy raises many questions. In a global mass market economy how can homegrown artisan products find a market and thrive? Is Portland a frontier in the transformation of urban economies or a cultural anomaly representing a romantic, populist turn away from the global? Is artisan production limited to a narrow range of expensive, high-end retail products or are we observing a broader shift from homogeneous, mass produced, mass marketed products to hand-crafted, limited production products that engender a more personal relationship between producer and patron? If the artisan economy is part of a seismic shift in how we do things, is this transformation grounded in a larger moral shift in values toward local, sustainable, self-reliant systems of making and using? The Artisan Economy Initiative works collectively to examine these and other questions stimulated by the book and by a growing literature on the role of arts, culture and creativity in economic development. Through research, advocacy and outreach, we engage both scholarly and popular audiences in understanding and creating connections between local artisans, organizations which support them, policy makers and the public at large. The purpose of this blog is to be a forum for a conversation for those interested in the work of artisans and the economic transformation they embody. While the focus of our research will emphasize Portland, we hope that this is only a starting point for comparative work by ourselves or others. The AEI blog will offer short essays, real time access to our research work, as well as links to our publications in academic and popular forums. It will be an aggregator for research on artisan, cultural and creative economy literatures. It will serve as an archive for our raw data from interviews, surveys, archival information as well as our bi-weekly meetings. We hope you find this forum useful and invite your comments.